I had a lovely book in the mail the other day from over the waters. 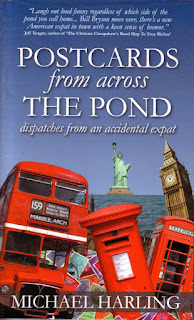 Michael Harling sent me a copy of his delightful Postcards from Across the Pond. Unfortunately, it was a few days before I was able to read the book. My husband picked it up and started thumbing through it. Before long, he was laughing out loud and reading sections aloud to me. I knew then that I'd have to wait before I would be able to read it. Thank goodness, the book is so readable and enjoyable so that I didn't have to wait long. Mike has kept a blog of his experiences as an American in Britain at Postcards from Across the Pond (and before that on his website here). Before long, he realized he had enough material for this charming book. Unlike others I could mention the author of this book seems to genuinely enjoy his life in his new, if occasionally strange, country. As someone who also married a "furriner" and has lived abroad, I can recognize many of the situations described in this book. Daily activities which should be simple (mailing a letter, opening a door, locating an address) suddenly become fraught with confusion and multiple chances for making yourself look stupid. I can also identify with the problems he describes with immigration. (Although as an aside, it is much easier as an American to move to another country than it is to LEGALLY bring your foreign-born spouse to the U.S. The U.S. has numerous seemingly pointless rules and regulations, all of which involve the payment of large fees, not to mention gestapo-trained employees who delight in barking orders and slamming doors in people's faces. Or that has been my experience.) I also had the experience of attempting to navigate an immigration office that was staffed with non-native speakers. I can still remember my indignation when a security guard at the American Embassy in Stockholm yelled something at me in gibberish (although it was probably Swedish, which I didn't understand yet). I mean, wouldn't you expect that at the American Embassy that they might speak American?? But I digress . . . There's also a really handy and humorous glossary at the end of the book which explains such terms as berk, nick and yob. I'll have to keep it close by the next time I watch Eastenders! I was interested to note that this book also pointed out the seemingly unique British quirk of not rinsing the soap suds off dishes. This was the second time I've encountered this issue recently, so it's definitely something that needs further investigation! It might have something to do with the fact that most homes in Britain used to be fitted with single basins and not double ones as a lot of American homes are. A single basin makes it difficult to rinse your dishes because the dirty water ends up in the fresh dish water. You have a point! Still, with the hot and cold taps being separate, it seems like it would be easy to have a trickle of hot water going for rinsing purposes. I would love to find out what we do that the Brits find hard to understand. I'm sure there's plenty! Chris, do you remember what the original logic was behind not washing the suds off? Inquiring minds want to know! Is it also common not to wash the suds off the car when it's washed? I'm not trying to be silly, I'm just really curious and concerned!